Stores are already stocked up on Christmas decor, but can we revel in pumpkin season for a little bit longer? Spicy pumpkin desserts deserve their heyday. I’m going to risk being heretical here, but I say skip the pumpkin spice latte (gasp! 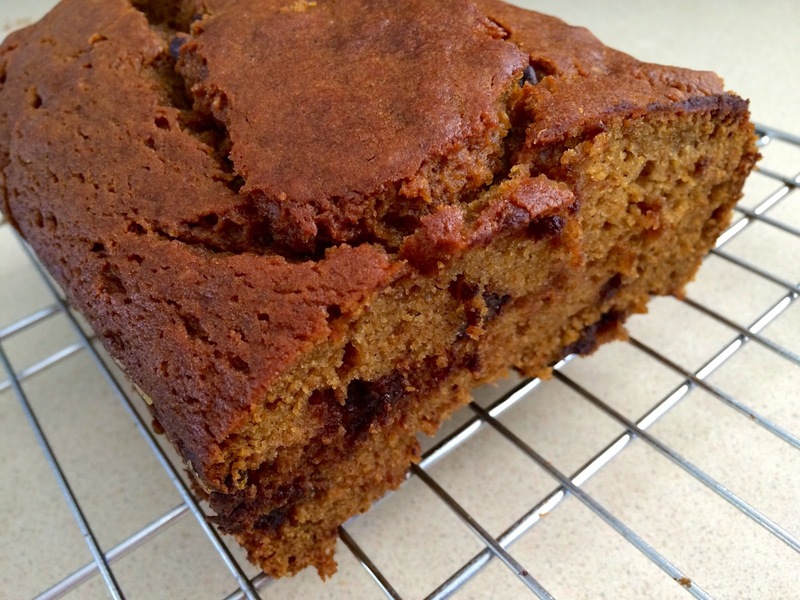 ), and make this pumpkin chocolate chip bread instead. I’ve made this pumpkin bread many, many times, and it is delicious. It’s sweet, spicy, and moist. Add in chocolate chips, and it’ll take you to new levels of joy. The recipe makes 2 loaves. One for you, one for a friend if you feel like sharing. The bread also freezes well, so you can enjoy some later. Preheat oven to 350 degrees. Grease and flour 2 9×4 1/2 (or 8×4) loaf pans. In a large bowl, combine pumpkin, eggs, oil, water, vanilla extract, and sugar until well blended. In a separate bowl, whisk together flour, baking soda, salt, cinnamon, nutmeg, cloves, ginger, and cardamom. Stir the dry ingredients into the pumpkin mixture until just blended. Gently fold in the chocolate chips. Pour into the prepared pans, and bake for 60-70 minutes (or 50-60 minutes if using smaller loaf pans) until a toothpick inserted in the loaves come out clean.